It's fall. And for me that means a couple of things: soup. crock pot. Can we talk for a minute about how much I love my crock pot? I may have an entire pinterest board dedicated to it. And a couple of weeks ago it broke. That was a sad, sad day. Then last night Nick and I had a little date night at Target (keep it hot, people) and I bought this beauty. I've never been so happy over a broken appliance in my life. Back to soup. This recipe is so good, and my favorite: so easy. perfect any day of the week. Put all ingredients except chips, avocados and cheese into the crock pot. Cook on low for 6-8 hours, or on high for 4. Remove and shred chicken and add back into the soup. Fill each bowl with chips, cheese and avocado. Pour hot soup over the top, stir and serve. Top with a dollop of sour cream, a little extra cilantro, and some hot sauce if you want to kick it up a notch. What's your favorite crock pot recipe? YUM. This just may be dinner tomorrow night! In other news, we just had chicken cranberry pot pie, ala crock pot last night. AMAZEBALLS. This looks and sounds delicious! 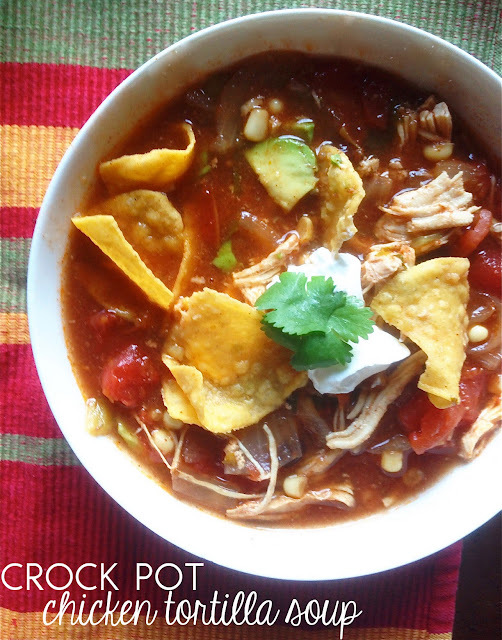 I have several really good Chicken Tortilla Soup recipes but not one quite like this. Just bought the ingredients this week and can't wait to give it a try. I think my family will love it! Thanks for sharing, Carina... Hugs to you and your sweet little ones! Just made this. AMALZING! You go girl.